Desfrute de um dia ao longo da famosa costa de Amalfi em uma excursão em grupo saindo de Nápoles. Saia para explorar uma das regiões mais deslumbrantes, a Península Sorrentina, onde você será presenteado com vistas espetaculares em cada curva. Ao longo do caminho, você visitará as vilas de Positano, Amalfi e Ravello. Faça uma parada para um almoço italiano na cidade costeira de Conca dei Marini, com vista para o mar. Enquanto estiver lá, não perca a caverna marinha natural conhecida como Grotta dello Smeraldo, conhecida por brilhar como uma esmeralda. The tour was extremely beautiful! Lea The guide was lovely, the driver managed to get through the hard roads safely. We had free time in Amalfi and Ravelo, small launch in a resturant with fantastic view. Beneath the resturant there is emerald cave which who ever wanted entered. Great experience, highly recommended. This was my first time in Italy so of course I wanted to see the Almafi Coast. I was worried that my mom and I would be missed getting picked up because of the amount of people at the pick-up location,but our guide,Theresa, were able to find us. I thought there would be Wi-Fi and water provided,but it wasn't. I wish the bus was bigger so more people would have a chance to have a better view of the coast. The driver was excellent! Overall the trip was great! Positive side the views were incredible. Our guide/driver Antonio was not so stellar. The other people in the van felt the same way. Rarely spoke. Didn't help a/c in the van barely put out cool air and Antonio couldn't figure out how to operate the rear a/c until he finally called someone else. Could have spent much less time at the overpriced Limoncello store/plant. We booked semi-VIP tour for maximum 8 people but ended up with 10. Our group was 6 and 4 people added were from a cruise ship. As these 4 people had to be back at the specific time our tour was shortened a bit. The traffic is VERY bad however other buses were stopping now and there to take pictures and see the view but we did not have any stops as were rushing to get back on time for the cruise ship and therefore no pictures and if you are on the wrong side of the bus no views either. The restaurant for lunch and lunch itself was very good probably the highlight of the whole day. Be prepared for huge crowds and queuing everywhere. We had the most amazing experience! The lunch was delicious and the tour guide and driver were very friendly. The views from the restaurant that we ate lunch at were truly magical. I would highly recommend this tour! The tour guide was waiting for us outside the cruise port. The views along the Amalfi coast are breath taking. It's my new favorite spot in Italy. If you are prone to motion sickness you may want to take some Dramamine as you drive down a lot of winding roads... but it's so worth it! We stopped at several places along the way...a lemoncello factory where we sampled chocolates and lemoncello. The views were great from the factory. We stopped in one spot to see positano. Then we stopped in Almafi and walked around while we ate gelato and visited the beach. I found lots of little pieces of sea glass along the beach. Our last stop was in Ravello which is such a charming town. The entire tour was amazing I can't say enough good things about it! Overall, we were happy with the trip. It was raining, so we did the itinerary backward. Lunch was included and if the weather had been good, I'm sure the view would have been wonderful. The other family books on the van canceled because of weather. We were very happy that the tour continued. We spent a lot of time asking questions and were intrigued by the answers. Great churches in Amalfi and Ravello. We also had time to tour the villa in Ravello, right next to the church. Good stop for Lemoncello tasting with the possibility of purchasing afterward. A great day out! We had a lovely guide, Sabrina, who was very informative and genuinely wanted us to have the best experience. There were only 3 of us which made the trip more personal. We were taken to some beautiful places along the Amalfi coast with some stunning scenary! A good visit overall to the very famous Amalfi Coast. As advertised it was for a small group of tourists, 10 or 11. The driver was quite good, maneuvering the winding roads. The guide was knowledgeable, chiming in with interesting descriptions of the surrounding from time to time. Too little time for taking in the scenery along the road side, however. 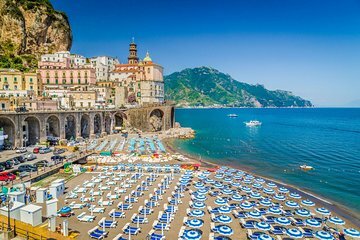 A suggestion would be to intersperse a few short stops along the drive to see a little more of Sorrento and Positono, A guided walk in Ravello would also be more interesting as we never got to the sightseeing spots of the coastline, on our own. The lunch was not quite to the level that we had with our other tours on this trip to Italy. Having said all that and despite the wintry weather and scenery, the day was very pleasant and my wife and I enjoyed the tour.